Wasps are generally regarded as pests when they fly around your picnic or barbeque (especially if they sting you), but in the garden they compete with bees for food and eat caterpillars (ever wondered why your monarch butterfly caterpillars were disappearing?). Once you have caterpillars on your swan plants, cover them over with netting to prevent the wasps getting in. 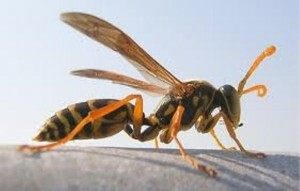 Not all wasps are pests, in fact some play an important role in natural biocontrol. 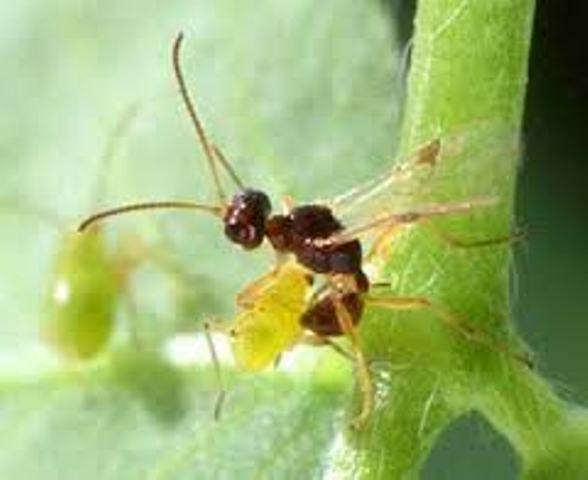 Almost every pest insect species has a wasp species that is a predator or parasite upon it. 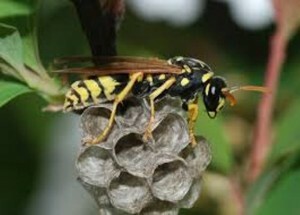 The main nuisance wasps are the social wasps that live in colonies: German and Common Wasps (Vespula germanica and V. vulgaris) and Australian and Asian Paper Wasps (Polistes humilis and P. chinensis). Both will strongly defend their nests if you get too close. German and Common Wasps are the familiar yellow and black wasps; their nests are mostly found underground or in cavities so you are less likely to see them. Paper wasps are much slimmer and their legs hang down; you are much more likely to see their umbrella shaped nests hanging under eaves or branches. You can wait until the wasps are inside in the evening and then spray the nests with fly spray to kill them (or call a pest exterminator). If you can’t find the nests then you can help reduce their numbers by using a trap and attracting them in. During the summer months wasps gather protein to feed their growing larvae and then later in autumn they switch to nectar to fuel their own mating rituals. This is important to understand to use the right bait for them – in summer you will need to include a protein such a piece of meat in the trap whereas later just a sugar syrup will be fine. I tried a wasp trap in my garden this year – probably too late in the season to make a big dent in the population but it certainly caught wasps. I will start trapping in early summer next year. Mine was an EasyTRAP trap that I bought at the garden centre; you can buy their bait sachets or make your own (see below). They say to hang the traps 10 metres away from any barbeque or seating areas. You can make your own wasp trap by by cutting the top ¼ off a large plastic bottle. Glue or staple it on upside down, so the narrow opening faces down into the bottle – and then half-fill the container with a soft-drink or sugar and water, with a little detergent. During summer, add a piece of smelly meat. 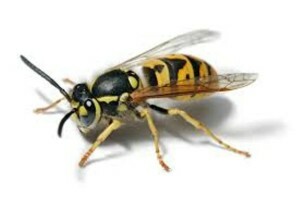 The wasps will fly in to feed on the sweet and/or smelly solution and cannot fly out again. You do need to clean the traps out regularly and replace the bait – be careful to make sure the wasps are dead before you do so to avoid getting stung. If you have made your own trap you may just want to throw away the bottle and the wasps, and make a new one. Life’s Bounty is about all the things I enjoy experiencing, creating, and sharing. Join me as I travel in search of new experiences; coax more produce from my backyard in Auckland, New Zealand and preserve the harvested bounty; and try my hand at making anything from cider to jewellery to cards to gift packs of soap.